The Headquarters is in Damansara Heights, Kuala Lumpur, Malaysia. Over the years, Proven Group of Companies (PGC) has undertaken more than RM1 billion worth of projects. These include affordable houses to the very high end boutique bungalows, factories, malls and supermarkets, offices and retail units, schools, hospitals, prisons, bird houses, apartments, hotel and civil engineering & infrastructure projects. PGC is headed by Dato‘ Yusof Jusoh and his team of experienced professionals in the Development and Construction Industry and the Manufacturing of IBS Products. The company not only has training programmes for its workers, but also for users and installers of Proven IBS. Proven Training Academy (a subsidiary of PGC) is working closely with (CIDB), Malaysia in its training programmes. Besides its training centre at the Headquarters, it also conducts training for Contractors and Proven IBS users in Perlis ,for the Northern Region. It plans to set up two more training centers in Johor, covering the Southern Region of Malaysia and also another one in Terengganu, covering the Eastern Region. The Company also does training (Proven IBS’s user) at its factory and at the construction sites. PGC is a PKK Class A and (CIDB) (G7) contractor and is registered with the Government of Malaysia. Since the Government has made a policy that IBS should be used extensively in the construction project for the GOVERNMENT and the PRIVATE sector, the company has made itself very relevant in the field of IBS. The company is currently assisting the Government and the Private Sector to ensure the success of the IBS implementation introduced by the Government. PGC is extensively involved in the Training of Contractors to use Proven IBS, supplying Proven IBS products to contractors (who do not possess the IBS building materials) and undertaking many projects using IBS, besides supporting potential contractors successful in their bids for the Government, Semi Government and private projects by using Proven IBS System. 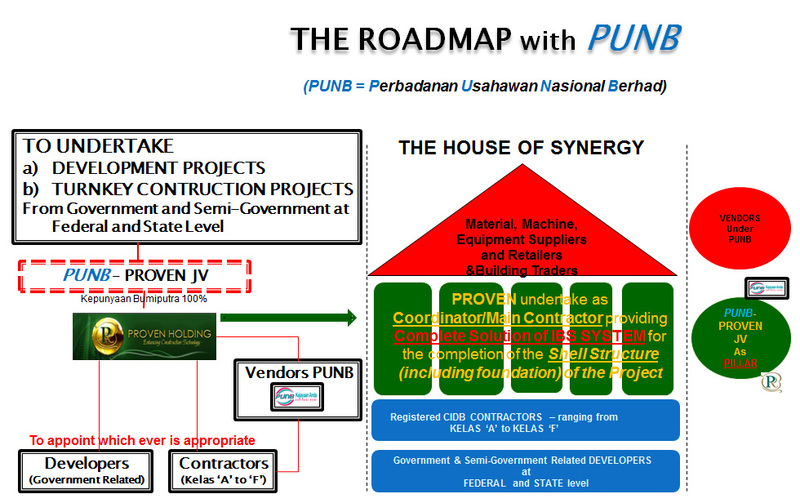 PGC is also working closely with the Government and Semi Government agencies. 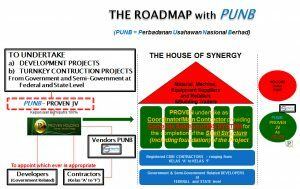 Currently, the company is working with Perbadanan Usahawan Nasional Berhad (PUNB) especially , assisting PUNB’s retailers, suppliers of building materials for Proven’s own projects and training the Bumiputera Contractors to qualify and enable them to participate in Government Projects. It is also working closely with FELDA (Federal Land Development Authority) in using IBS. The company is in the process of working with more Government and Semi Government Agencies in the area of IBS. The Company takes pride in the quality of its IBS products. The Proven IBS products are being checked constantly by SIRIM (Standard and Industrial Research Institute of Malaysia) and is also certified under ISO 9001:2008 Quality Management System. Quality Control is of utmost important in our Group of Companies. To ensure the quality of the it’s IBS products maintained and improved, Proven IBS is collaborating with University Malaysia Perlis in the research of using geo-polymer products to replace the cement which is getting more expensive and scarce in certain areas. PGC is doing research with Bandung Institute of Technology through its subsidiary, PT Titanium Property, in Indonesia. The Company is also working closely with University of Prince Songkhla in Southern Thailand in improving the Proven IBS products. The Group has almost completed its research in building a house as a package that can be bought and built by everybody in the country. It will have all the necessary instruction that enable even a family or few people to build a house. The Company is also working with machine experts to produce mini mobile machines that can be used by contractors around the country.